Researchers have found evidence that an environmental pollutant may play an important role in causing multiple sclerosis and that a hypertension drug might be used to treat the disease. The toxic substance acrolein was elevated by about 60 percent in the spinal cord tissues of mice with a disease similar to multiple sclerosis, said Riyi Shi, a medical doctor and a professor of neuroscience and biomedical engineering in Purdue University's Department of Basic Medical Sciences, School of Veterinary Medicine, Center for Paralysis Research and Weldon School of Biomedical Engineering. The research results represent the first concrete laboratory evidence for a link between acrolein (pronounced a-KRO-le-an) and multiple sclerosis, he said. "Only recently have researchers started to understand the details about what acrolein does to the human body," Shi said. "We are studying its effects on the central nervous system, both in trauma and degenerative diseases such as multiple sclerosis." The toxic compound is found in air pollutants including tobacco smoke and auto exhaust. Acrolein also is produced within the body after nerve cells are damaged. 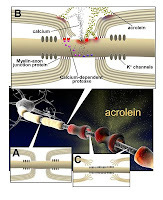 Previous studies by this research team found that neuronal death caused by acrolein can be prevented by administering the drug hydralazine, an FDA-approved medication used to treat hypertension. The new findings show that hydralazine also delays onset of multiple sclerosis in mice and reduces the severity of symptoms by neutralizing acrolein. "The treatment did not cause any serious side effects in the mice," Shi said. "The dosage we used for hydralazine in animals is several times lower than the standard dosing for oral hydralazine in human pediatric patients. Therefore, considering the effectiveness of hydralazine at binding acrolein at such low concentrations, we expect that our study will lead to the development of new neuroprotective therapies for MS that could be rapidly translated into the clinic." The researchers also learned the specific chemical signature of the drug that binds to acrolein and neutralizes it, potentially making it possible to create synthetic alternatives with reduced side effects. The studies are detailed in a paper appearing online this month in the journal Neuroscience. The paper was written by doctoral students Gary Leung, Wenjing Sun and Lingxing Zheng; graduate research assistant Melissa Tully, who is an MD-Ph.D. student at Purdue and the Indiana University School of Medicine; postdoctoral researcher Sarah Brookes; and Shi. In multiple sclerosis, the myelin insulation surrounding nerve cells is destroyed and the nerve fibers themselves are damaged. "We think that acrolein is what degrades myelin, so if we can block that effect then we can delay the onset of MS and lessen the symptoms," Shi said. Acrolein induces the production of free radicals, compounds that cause additional injury to tissues after disease or physical trauma. "We've discovered that acrolein may play a very important role in free radical injury, particularly in multiple sclerosis," Shi said. The elevated acrolein levels in the MS mice were cut in half when treated with hydralazine. The drug represents a potential long-term therapy to slow the disease's progress. "To our knowledge, this is the first evidence that acrolein acts as a neurotoxin in MS and also the first time anyone has demonstrated hydralazine to be a neuroprotective drug," Shi said. 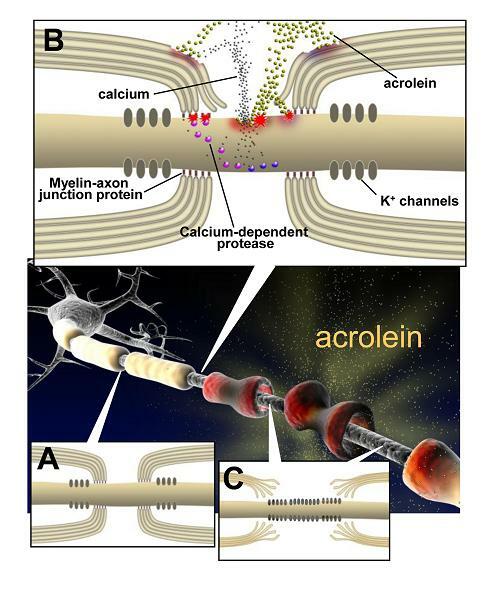 Other researchers had previously shown that acrolein damages liver cells and that the damage can be alleviated by hydralazine, leading the Purdue researchers to study its possible effects on spinal cord tissues. Further research will be conducted, and Shi's group has identified other potential compounds for binding acrolein. The research team, in a possible future collaboration with the Indiana University School of Medicine, also is working to improve the sensitivity of detection methods to measure acrolein levels in people with multiple sclerosis.